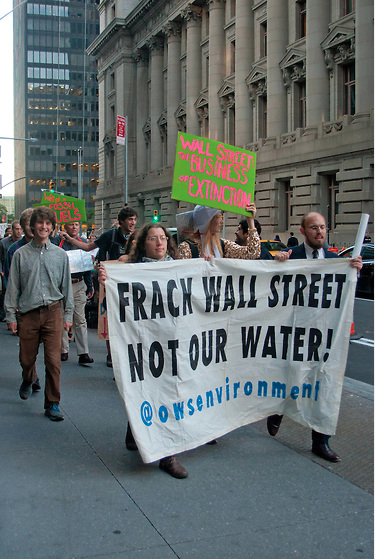 S17 Eco-Block marching New York’s Financial District yesterday. Photo by John Duffy. On the one year anniversary of Occupy Wall Street, members of America’s wealthiest 1 percent were rounded up in New York’s Financial District and led away in handcuffs. The NYPD, whose hands were full chucking demonstrators into the back of paddy wagons yesterday — about a hundred total — seeded jurisdiction over the suits to a higher authority: gangs of polar bears roaming the narrow streets surrounding the global finance hub. Their suspects were wanted for embezzling natural resources, bribing politicians through campaign contributions, funding perjurious climate denial think-tanks, impersonating people, engaging in ecocide and attempting to foreclose on Earth. Due to the symbiotic relationship between the exploitation of the planet and the exploitation of people, the bears formed a joint task force that included students indentured to thousands in student loans, teachers facing attacks on their union, droves of unemployed, nurses in green Robin Hood hats demanding a financial transaction tax and other rabble roused members of the 99 percent, who were on the hunt for Wall Street bankers as well. These polar bears were members of the 99 percent as well — literally. Their paws were painted socks; their hats, wool beanies with ears stitched on. They were members of the September 17 Eco-Block in costume. The activists donned the bear regalia like Mayan head-dresses to channel the spirit of the animal that has become symbolic of climate change. Meanwhile, the suspects in their custody were really their comrades chaffing in ties and toy cuffs to help them illustrate a point; Wall Street is bankrolling climate death. There’s an estimated $27 trillion worth of fossil fuels remaining on this planet, and you can bet your bottom dollar that the 1 percent plans on burning every last drop of it for the cash, causing our planet to heat-up exponentially. Confronting the ecological crisis is not something fresh to the Occupy movement. Just as activists fighting mass incarceration can see the hidden hand of the market locking up blacks and Latinos in private prisons and AIDS activists have seen it driving up the cost of medication, we have seen the market’s index finger drilling wholes in the earth for oil, its smoke stacks thumb the sky, and its fists punch out the rainforest. The past year has been one of confronting nukers, drillers, greenwashers and climate change bankrollers, but this summer things have really heated up. Some are calling it the Summer of Solidarity. “The Summer of Solidarity is a term we are using to describe a phenomenon that is sweeping the country, putting environmentalists on the wheels of the machine,” said Lum. Coal plants, nuclear weapons facilities, drill sites and a mountaintop removal mine in West Virginia have all been temporarily shut down recently because activists stood in the way. Most recently, five comrades and I occupied the site of a fracked gas pipeline that is entering Manhattan’s West Village, shutting it down for an afternoon. We did so in solidarity with people in Pennsylvania — where the gas will be sourced from and has already caused much environmental destruction — as well as the people in upstate New York, who are being threatened with fracking, should Governor Andrew Cuomo decide to let drillers in. Over at Wall and William Streets, an army of police in riot gear was on hand to make sure we didn’t get any further. Driven away from the Stock Exchange by a wave of blue, the sounds of those who had fallen into the arms of the storm troopers followed us toward the East River and along Water Street. We disbanded and set about putting the breaks on business as usual as best we could in roving packs — some as big as a hundred, some as few as three. Melt-in in front of Bank of America. Photo by John Duffy. All our pack of about 30 people had to do to shut down a Bank of America branch kitty-corner to the famous statue of the Bull was show up. 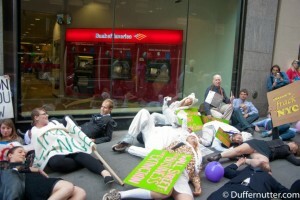 We stood out front singing, “Wall Street bankers melting down, melting down, melting down / Wall Street bankers melting down our green planet.” With the bank’s glass doors firmly bolted by security personnel and its employees looking on, we sprawled out supine on the pavement. A blue and white helicopter roved overhead and the sound of police sirens going off on all sides told us that our comrades were everywhere. Eventually the NYPD moved in, rows of plastic handcuff bracelets looped round their haunches. We leapt to our feet, chanting, “We are unstoppable, another world is possible.” The chant seemed more appropriate than ever. If 30 people can really shutdown a bank simply by singing at its doors, imagine what the entirety of the 99 percent are capable of. Better yet, we managed to do so without going to jail and breaking our next appointment back near Zuccotti Park. Sock and beanie polar bears, faux 1 percenters and the rest of the Eco-Block regrouped down at Bowling Green. Across from us stood the Museum of the American Indian, a building shared with the Federal Debt Court. Rebecca Manski who helped orchestrate the day’s action pointed out to me the significance of the spot we occupied Monday. “The Lenape Indian Nation made a deal with the Dutch here,” said Manski, referencing the famous sale of Manhattan, today worth about about $800 billion in real-estate, purchased for the equivalent of less than $80 in 1626. It was around 10 a.m. at this point and close to a thousand people were assembled at Bowling Green. We gathered in a circle around Reverend Billy Talen — a radical social justice preacher and longtime staple of the New York left, who has become Occupy’s unofficial minister. “Remember one year ago?” asked Reverend Billy, gesturing to the ground as if his arm were trying to draw a heavy chain from the bowels of the earth. The crowd was much larger than the previous year and growing as more and more flooded in from the surrounding streets. I thought back to when I first turned up that Saturday a year ago. Reverend Billy was on hand then too, walking around with his bobbing blond pompadour, testifying against Wall Street to all who would listen. He was accompanied by robed members of his Stop Shopping Choir — a confusing spectacle since there was a flock of actual Christians on hand in robes handing out literature. A more new-agey crowd was striking yoga posses in the center of the park. The various socialist sects of the New York left had dusted themselves off as best they could for the occasion and were waving placards proclaiming class politics left over from marches long past. There were “Truthers” too and even a smattering of Ron Paul devotees. But mostly it was people with a deep feeling of dispossession who wanted to do something about it. Aside from the novel idea of not being pushed home by the multitudes of police waiting in the lurch nearby, there was no hint of what would emerge. I wonder if Police Commissioner Ray Kelly lies awake at night regretting not finding some excuse to crack down on that first “sleepful” protest. Out of the tangled assemblage of that day movements were eventually born; movements to cast away debt, keep families in their homes, stop police violence and racism, strip money from politics, work toward healthcare for all and an ecologically sustainable planet. A year ago, I’d never spoken to more than 40 people at once, led a meeting, stopped traffic or shutdown a bank branch. I’d never been locked up for deliberately breaking the law, pushed against a steal barricade or pulled a protester over one out of the arms of a policeman. I’d never eaten lentils in the snow, so warm and delicious because each bite was a reminder of what we are capable of together. Threats and coercion failed to remove the occupation. We could only be evicted through violence and that has its limits. There are more of us than there are of them. The hope of Occupy is that the sirens activists sent ringing through the financial district on its first birthday will be overtures of the 1 percent’s eventual doom and that one day a just and sustainable world can kick down the barriers before it and occupy the planet. Thank you for this lovely writeup. Were you part of the Diverse Women for Diversity at Navdanya? One of Occupy’s greatest strengths is the focus on the sustenance and natural economies rather than just political action alone. In that regard, folks would do well to take a look at Vandana Shiva’s “Earth Democracy” We very much need a Gandhi to show the way to independence from the corporate greed economy. Fortunately we have Dr. Shiva. I think Occupy would do well to put together some cohesive “traditions” like those of the 12-step programs which keep groups united around a primary purpose: In working with National Occupy Wall Street in April as well as several local Occupies in FL & NC, our working group(s) came up with 12 proposals based generally on a primary purpose of restoring/empowering government of, by and for the PEOPLE (not the corporations). Once we toss out the corporate (and corrupt) middle “men” and get real, honest and humane, we can have a democracy that works! Energy and the environment have proven that in cloudy Germany, Gainesville, FL and Ontario Canada where the communities work together to democratize the energy grid with distributed rooftop solar that profits everyone and saves the environment. These places have the lowest unemployment, best economies and most hopeful, cooperative citizens in the world! Everyone might want to read Jeremy Rifkin’s The Third Industrial Revolution (see Diane Rheem show inteview)for a preview of how it can and is being accomplished. Then we might work to develop guidelines to ensure our continued unity around a common solution to the most urgent issue of our time: Preserving the only home any of us has.